‘Ask An Expert’ Added To DPS Drive – Interactive Theory Test Lineup! Following the recent launch of DPS Drive – Interactive Theory Test (ITT), DPS Computing Limited has been investigating a number of ways in which we can add more features to the products – at no extra cost to you, the customer. The latest feature that we can announce, and will launch immediately, is our ‘Ask An Expert’ feature. So, what is Ask An Expert? Well, we understand that sometimes you may have questions regarding your theory test. These might be general questions such as ‘how do I book my theory test’ or ‘how many questions are asked on my theory test’. Equally, they may be more specific questions, even questions relating to a practice question that you have encountered in DPS Drive – Interactive Theory Test. Whatever the question regarding your theory test is, or any of the content in DPS Drive – Interactive Theory Test, our panel of experts are waiting to receive and answer your questions. All of our experts are fully qualified Advanced Driving Instructors, who currently teach pupils in the UK to drive and have a full, valid and current permit to offer driving instruction in the UK. So, you can be sure that the answers you get from our experts are correct, of a high quality and compliant with the current theory test rules, regulations and practices. DPS Computing Limited have added this feature so that you can be sure that any uncertainties you have regarding your theory test can be answered quickly, efficiently and correctly. The Ask An Expert feature is available to all current DPS Drive – Interactive Theory Test customers as well as, obviously, all future customers ordering DPS Drive – Interactive Theory Test. To access this feature, simply select the new ‘Ask An Expert – DPS Drive – ITT’ menu option from within your personalised customer area. Finally, we’d like to wish the best of luck to all DPS Drive – ITT customers taking their theory test in the near future :). DPS Computing Limited is proud to announce the release of its inaugural software product and web based application DPS Drive – Interactive Theory Test (ITT). DPS Drive – Interactive Theory Test (ITT) is suitable for a wide range of people and businesses. From learner drivers to experienced drivers and from self employed driving instructors to driving schools. So, what are the features in DPS Drive – Interactive Theory Test? Well for a start it’s fully updated with the 2012 revision banks from the Driving Standards Agency (DSA). The Driving Standards Agency is the government agency responsible for setting the theory test for learner drivers throughout the United Kingdom – so their revision banks are by far the most useful to practice with. And DPS Computing Limited obtained a license for these revision banks a little while ago. Since then, we have created DPS Drive – ITT and have gained approval for the web based application to be released. Familiarity of doing the same test over and over again only has limited usefulness when revising for your theory test. The best way to truly test your knowledge and allow the driving theory to sink in is to try different random tests again and again. This way you are testing your understanding of the driving theory and not that you can recall the answers to certain questions in a certain order. This is of vital importance. As the DSA do not publish the ‘official’ theory test questions any more, there is no way to practice the ‘real’ test before you actually take it. 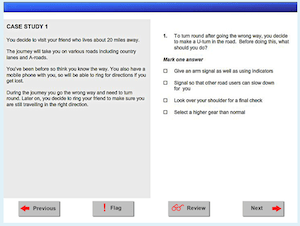 You can be asked anything relating to driving theory on your theory test. So, it’s best to cover everything. And that’s why we have included every single one of the questions from the revision banks provided to us by the Driving Standards Agency, giving you the best possible chance of successfully revising for your theory test and passing first time. Forget about paying for the latest version. Every update to DPS Drive – ITT, including bug fixes, minor updates and new major version releases are provided to you completely free of charge – for the entire duration of your license. No need to worry about not having access to the latest questions and application! Sometimes pictures help to visualise things and understand the questions more fully. Every picture provided to us by the DSA with their revision banks is included in DPS Drive – ITT in the relevant questions. Web based application. Forget about the majority of technical problems you can encounter with traditional software. These are mostly eliminated by the DPS Drive – ITT web based application concept. Less errors, less setup time, more practice, more value for money :). Want to practice at 4am? That’s no problem – DPS Drive – ITT is available 24 x 7 x 365 – so its there when you want and need it! However, we wouldn’t recommend staying up till 4am practicing on the day of your theory test! ;). Honestly, we’re being serious! Practice until your fingers drop off!! OK, maybe not that much practice – but you know what we mean! ;). Just remember, don’t be sharing your log in details – our security systems are primed and monitoring 24 hours a day – and we don’t want to have to cancel your license! :(. By all means recommend it to a friend though – after all, its only the equivalent of £2 / month. And what can you get for £2 / month these days?! Now there’s no point answering the questions and not knowing whether you got them right or wrong….. right? ;). Get a review at the end. ITT will turn into the teacher and give you a tick or a cross to tell you whether you got it correct or incorrect and also give you the correct answer to the question. Neat :). Only have 5 minutes spare? Just select 10 questions. Want to practice a test as long as the real deal? That’s no problem – select 50 questions. The final summary screen will tell you how many you got right and wrong and your percentage. You will also be shown the current Theory Test pass mark and percentage for reference. You can select to answer 10, 15, 20, 25, 30, 35, 40, 45 or 50 questions. Scale your practice test to your practice time available! We’ll provide you with your own nice area to access DPS Drive – ITT. The other great thing is that future DPS Computing web based products and services that you order will also be available from the same area. We’ll lend you your own little part of DPS Computing – we like to be the caring, sharing type!! Don’t worry, there’s free technical support available with DPS Drive – Interactive Theory Test. No £1.50/minute premium rate phone lines here! Drop us an e-mail, use the contact form, call the office, Facebook us, send us a tweet, G+ us – free technical support provided in all the ways that you can contact us! Add a spot of branding to your pupils / users areas – we’ll happily add your company logo to the DPS Drive – ITT page for your pupils and users. (Business/Driving Instructor/Driving School licenses only – obviously ;)). Well its one thing to know the correct answer (or not know it!!). But why is the correct answer correct? Don’t worry, each question includes the knowledge and understanding text from the DSA revision banks so that not only do you know what the correct answer is but you also know why it is the correct answer. Aids your learning and ensures that you go into theory test fully prepared! So there you have it! The most comprehensive and up-to-date theory test package available on the market. And all for a bargain price. Currently individuals can gain 6 months access to DPS Drive – Interactive Theory Test for only £12! Driving schools, driving instructors and businesses can gain access to DPS Drive – Interactive Theory Test for 10 pupils / users for only £20 / month! The best price for the best quality – make sure you don’t miss out on this gem. Order it now or view the details of DPS Drive – Interactive Theory Test on our website. DPS Computing Limited is proud to announce that it’s first piece of software, the web based online interactive theory test application, DPS Drive – ITT, has gained approval from the Driving Standards Agency and is now cleared for launch. Final preparations are being made ahead of the launch, which is expected to be within the next 24 hours. David Smith, Managing Director of DPS Computing Limited, said – “I am really excited about the imminent release of DPS Drive – Interactive Theory Test and I am sure that it will make the impact that we want it to on the market, with free updates, a bargain price and easy access for customers. When compared with many other products on the market or in the shops, DPS Drive – Interactive Theory Test is more comprehensive and more up to date – leading to an all round better experience and value for money for the customer. With the inclusion of the ‘Knowledge and Understanding’ text, which was previously only available in official DSA products, DPS Drive – Interactive Theory Test is crammed full of all the information that a learner driver needs to successfully revise for their theory test. Not only that, I am sure it will also become an invaluable resource for experienced drivers, newly qualified drivers, driving instructors and driving schools alike”. DPS Drive – Interactive Theory Test contains approximately 1000 questions and is available from £12 for 6 months access. The application is a web based application, which will be accessed from the DPS Computing Limited customer area and, as an online application, will provide convenient access for customers as well as stability. Also, as DPS Drive – Interactive Theory Test is an online application, it reduces technical issues associated with traditional software and allows almost universal access, no matter how the user chooses to access the application. A further press release will be made upon release. Stay tuned! :). DPS Computing Limited is proud and excited to announce that it is preparing for the launch of its first software application entitled “DPS Drive – Interactive Theory Test” (or ITT for short!). DPS Drive – Interactive Theory Test will contain revision banks licensed to DPS Computing Limited by the Driving Standards Agency. There are just under 1000 individual questions for ITT users to attempt. Practice Theory Tests will be able to be taken containing 10, 15, 20, 25, 30, 35, 40, 45 or 50 randomly selected questions – ensuring that every time you use the application a completely unique test will be created each time to truly test your driving theory test knowledge! In addition, ‘Knowledge and Understanding text’ is also included for each and every single question – something which was previously only available in official DSA software applications. At the end of each test the user is taken back through each of the questions attempted, given the correct answer and told whether they got the answer right or wrong. Finally, at the very end of the test, the users result is displayed along with the current pass mark and percentage for the driving theory test. Individuals – £12.00 for 6 months access. Driving Schools / Instructors / Businesses – £20.00/month/10 pupils(users). Additional users can be quoted for separately. DPS Drive – Interactive Theory Test includes the most up-to-date, 2012 theory test revision banks so that we can ensure that users have the latest practice questions available to them. With many other companies and shops still offering old versions of theory test applications (2011 and before), we wanted to make sure that users know that they are getting the latest, most up-to-date version of the revision material available. In addition we have devised an excellent pricing structure which equates to £2/month for individuals and £2/month/pupil(user) for driving instructors, driving schools and businesses. DPS Drive – Interactive Theory Test is without doubt one of the most comprehensive and up-to-date practice theory test applications on the market – don’t get tricked into buying old versions! Customers who have purchased access to DPS Drive – Interactive Theory Test get unlimited access to the application during their subscription period. Final approval from the DSA is being awaited by DPS Computing Limited, upon which we will release the application. Unfortunately, due to licensing restrictions prior to approval, we are unable to release a demo at this time. More information regarding DPS Drive – Interactive Theory Test will be released on the DPS Computing Limited website over the weekend with the software currently scheduled to be released and available for purchase by customers during next week, pending approval.